Also over on Cartoon Brew is a link to the current trailer for the new Marsupilami movie coming out in April in France. Marsu-who, you ask? 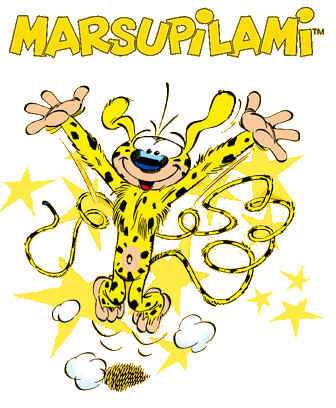 The marsupilami is a fantastic creature which came to us from the imagination of André Franquin, an influential Belgian comic book artist and creator, best known for his work in the magazine Spirou. The marsupilami is a mysterious jungle denizen known for its spotted fur, it’s exuberant cry of “Houba!”, it’s appetite for piranha fish, and it’s very VERY long tail… which usually went off the frame of whatever comic page it was drawn upon. Franquin used the character in the Spirou et Fantasio comics from 1952 to 1968, and the character has been revived several times since then — most notably in the Disney TV animation series Raw Toonage in the 1990’s. The estate of Franquin was not very thrilled with the interpretation of the character in that series — they went so far as to revoke Disney’s right to the marsupilami. Well now, the same French team that brought us the Asterix live-action movies have produced a live-action/CGI movie (HOUBA! 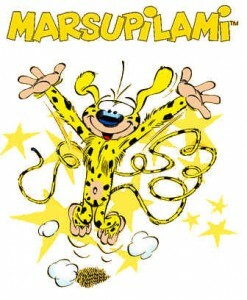 On the Trail of the Marsupilami), directed by and starring Alain Chabat. Check out the trailer and see what you think. The marsupilami itself is seen very little here, but it gives you a feeling for what the movie is going to be like.